Must admit: There was a period during my high school days when I was at least slightly agnostic while weighing the official verdict of the Warren Commission against all the alternative explanations and conspiracies. But that was a long time ago. Today I believe, as I have believed for decades, that it was Lee Harvey Oswald, and only Lee Harvey Oswald, who fired the shots that changed the world on Nov. 22, 1963. Yes, I know there are many people – some of them apparently quite reasonable and intelligent, and doubtless worthy of respect – who believe otherwise. 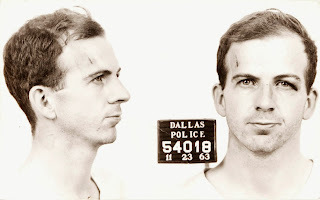 They believe that some group or groups of nefarious individuals – rogue CIA operatives, Castro-directed hit men, agents of the military-industrial complex, whatever – colluded to plot and commit the crime of the 20th century, perhaps with, but more likely without, Oswald serving as either willing participant or luckless patsy. But I seriously doubt any conspiracy of the size and sort that such an enterprise would have required could have remained a secret this long. To be blunt, if not crass: By now, somebody, anybody, involved in such a conspiracy surely would have popped up on Fox News or MSNBC or the New York Times Best Seller List or all of the above. If, of course, that conspiracy actually existed. As recently as last Saturday, when I viewed the fascinating CBS documentary As It Happened: John F. Kennedy 50 Years hosted by Bob Schieffer, I found myself again swayed by the evidence presented by computer animator and JFK assassination expert Dale K. Myers, whose digital enhancements of the original 8mm footage shot in Dealey Plaza by Abraham Zapruder make a pretty convincing case against claims of a second (or third) gunman. If there was any sort of cover-up, I think, it was a cover-up after the fact by people who should have had Oswald on their radar before he could pull the trigger. Schieffer: Well, the FBI and the CIA both withheld information from the Warren Commission. And we now know that through the reporting in recent years. But, again, it was a CYA deal. They were not part of a conspiracy. They were just afraid they were going to be blamed for not keeping [Oswald] on their radar, as you say. Would you agree that, for a lot of people, the notion that JFK was killed because of an elaborate conspiracy isn’t nearly as frightening as the likelihood that a single crazed gunman had such an impact on history? Schieffer: In a funny kind of way, yes. It was hard for them to accept and process that somebody who was a total loser was able to kill the person who held the most powerful office in the land. And I think that’s one reason why we have all of these rumors and all of these tales of conspiracy – it just didn’t fit into people’s plotline that something like this could possibly happen. But I think it probably did. Our conversation reminded me of a movie I reviewed back in 2007 at the Starz Denver Film Festival: Oswald’s Ghost, Robert Stone’s fascinating documentary about the enduring impact of the JFK assassination on America and Americans, and the cruelly taunting possibility that we will never know with absolute certainty whether Oswald pulled the trigger. [Marina, Oswald’s wife] for years has been haunted by the fact that was she to some degree responsible. But I think what Oswald saw was that if he committed the crime, if he assassinated Kennedy and he got away with it, then he would have an inner power that no one could ever come near. And, if he was caught, well then he was quite articulate, he would have one of the greatest trials in America's history, if not the greatest, and he would explain all of his political ideas. And he would become world famous and might have an immense effect upon history even if he was executed. So there he was, he knew that he had this opportunity, that Kennedy was going to drive by the Texas Book Depository. One can only imagine the terror, and the excitement, and the inspiration, and the woe that sat on him with the knowledge that he could do it, that it was possible to do it. That there were conspiracies being contemplated, attempted, even attempted on that day, I am perfectly willing to accept. But the conclusions I came to were for me rational ones, because he had a motive for doing it, because he was capable of doing it, because he wanted to do it. When he shot [Dallas police officer J.D. Tippit], I think at that point he knew he was doomed because he could no longer make the great speech. If you shoot a policeman forget it, you're a punk. And so after he was caught he did nothing but protest his innocence and say, "I'm a patsy." Oswald is a ghost who sits upon American life, the ghost that lay over a great many discussions of what are some of the roots of American history. What's abominable and maddening about ghosts is you never know the answer. Is it this, or is it that? You can't know, 'cause a ghost doesn't tell you. Do you think that Lee Harvey Oswald is Innocent? Oswald (along with Carlos Bringuier and Miguel Rafael Cruz and Celso Hernandez) was arrested in the 700 block of Canal Street on August 9, 1963.Judyth at Royal Castle. Carlos Marcello Town N Country Hotel 1225 Airline Highway New Orleans. Barry seal died Salvation Army 7361 Airline Highway Baton Rouge.David Ferrie Gas station 2316 Veterans Highway Metairie Lousiana.B.C.Seal Texaco located corner Acadian Thuway /Gov't St Baton Rouge 1960s.Anna Lewis & David Lewis came out admit knew Lee.They claim they knew David Ferrie, Jack Martin &Guy banister Investigation 531 -544 Lafayette/camp. The Sam Newman building house Mancusco coffee Shop. the Offices across street house agencies & post office. which cubans and david ferrie visit gene davis. along way -Opera House 601 Bourbon St. 11-22-193 Marcello victory party Royal orlean Hotel with circle of friends .During Garrison investigation Jack Martin / David Lewis gave testimony to him saying they saw Lee Harvey Oswald in New Orleans.1969 David Lewis lived with Jack Martin his wife .1311 North Prieur - 1836 Esplanade ave new Orleans.